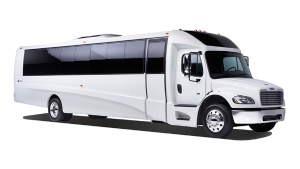 Provide your medium-sized group with stress-free transportation wherever you’re headed. The 25-passenger minibus allows your group to travel together without the need to separate between cars, public transportation, or rideshare apps. Travel around town with ease and never be disorganized again. Ride to weddings, corporate events, school events, amusement parks, and more in a clean, reliable minibus rental. We’ll show just how easy it can be when you call our 24/7 team at 1-844-693-9330.